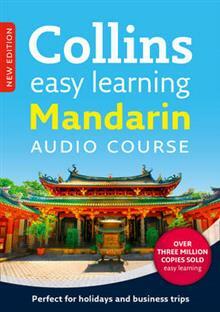 This exciting new Easy Learning language course allows learners to take on board all of the Mandarin they will need while abroad without the need for thick textbooks and complex grammar. 3 audio CDs and accompanying colour booklet make language learning fun, fast and flexible. The 3 audio CDs guide learners through a series of 12 short units. Each unit introduces 5 new key words or phrases before expanding on the basic vocabulary with practice activities, memory tips and culture and etiquette advice. An accompanying 48-page colour booklet provides full transcripts of the CD conversations as well as helpful hints to guide the user through their learning experience. Unit 1: Hello Unit 2: Excuse me Unit 3: Where's the bar? Unit 4: Over there Unit 5: What would you like? Unit 6: Have you got any...? Unit 7: Can you help me? Unit 8: I want to go to...Unit 9: Have you got a room? Unit 10: It hurts Unit 11: I want to make an appointment Unit 12: What's it like?